TAMPA, Fla. – The 2018 USL season saw goalkeepers make 3,378 saves across the regular season and playoffs including some acrobatic and highlight-reel efforts but now the time has come for you to decide which one was the best of all. 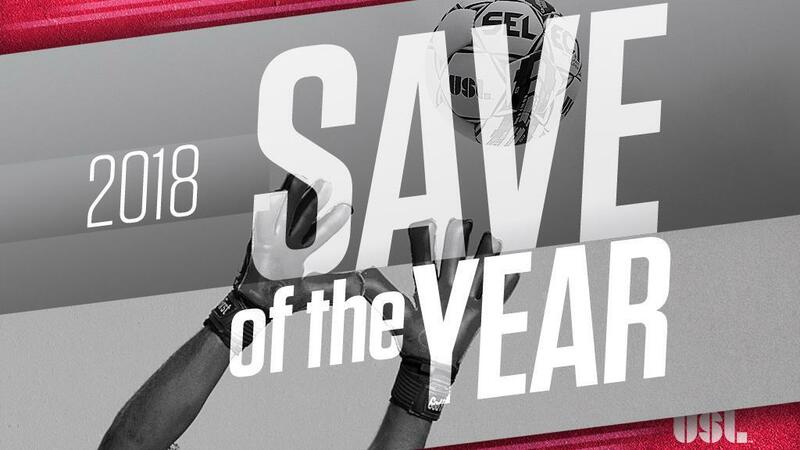 Voting for the 2018 USL Fans’ Choice Save of the Year competition opens Tuesday with 12 stops vying for the top prize in a knockout format that will be decided entirely by a fan vote on USLChampionship.com. The opening two rounds of voting will trim the field to three, before a fourth semifinalist will be chosen from the nine losing saves in "The Rebound" vote. Nine of the entrants earned their way into the Save of the Year bracket by being named Fans' Choice Save of the Month/Save of the Playoffs winners while two of the remaining three slots were filled by Save of the Month contenders that garnered a high percentage of the vote despite ultimately falling short of the number one spot. Trevor Spangenberg’s stunning series of saves for the Richmond Kickers rounded out the 12-save field by finishing top spot in the Fans’ Choice Last-Chance Vote last week. Now it’s your turn to narrow the field even further in the first round of voting for the USL Fans’ Choice Save of the Year award. Voting will continue through 12 p.m. ET on Tuesday, December 4. Maxime Crepeau (OTT) - #LOUvOTT, 9/22/18: Crepeau showed off his reflexes as he got down quickly to his right to keep out Niall McCabe’s first-time shot and keep Louisville City FC off the scoreboard early in their meeting at Slugger Field. Joe Kuzminsky (CHS) - #TBRvCHS, 8/8/18: Kuzminsky made a dazzling right-hand reaction stop to deny Tampa Bay Rowdies forward Junior Flemmings from opening the scoring on a clear-cut chance at Al Lang Stadium. Zac Lubin (PHX) - #SPRvPHX, 5/26/18: Lubin showed off his reflexes in denying two chances for the Swope Park Rangers, tipping Tyler Blackwood’s initial shot off the left post before recovering to keep out Rodrigo Savaria’s effort on the rebound. Carl Woszczynski (PHX) - #PHXvSPR, 10/26/18: Woszczynski led the USL Cup Playoffs in saves and produced one of his best with a close-range denial to keep out a big chance for the Swope Park Rangers’ Kharlton Belmar in Phoenix’s 4-2 Western Conference Semifinal victory. Alex Tambakis (NC) - #NCvLOU, 6/23/18: Tambakis produced an excellent stop to keep out a long-range strike by Louisville City FC’s Speedy Williams, palming the effort to the top-left corner over the crossbar in his side’s 2-2 draw. Alex Tambakis (NC) - #NCvPEN, 4/28/18: Tambakis turned away a one-on-one chance for Penn FC’s Mauricio Eustaquio as he rose to block a chipped effort as part of his third shutout of the season. Alex Tambakis (NC) - #LOUvNC, 10/9/18: Tambakis got down quickly to his right to keep out a right-footed effort from USL Golden Boot winner Cameron Lancaster in his team’s October clash with Louisville City FC at Slugger Field. Alex Tambakis (NC) - #NCvTOR, 7/21/18: Tambakis’ footwork was on point as he moved across his goal well to produce a diving save on a long-range shot by Toronto FC II’s Tim Kubel that was heading for his top-left corner. Matt Cardone (SA) - #TULvSA, 9/15/18: Cardone scrambled back toward his own goal and produced an acrobatic fingertip save to keep out an ambitious lob from distance by Tulsa Roughnecks FC forward Isaac Diaz at ONEOK Field. Diego Restrepo (SA) - #SAvLA, 8/4/18: Restrepo dove back towards his own goal and parried an ambitious dipping effort from the LA Galaxy II’s Frank Lopez onto his own crossbar before reclaiming possession and ending the threat. Evan Newton (CIN) - #CHSvCIN, 3/17/18: Newton got down to produce an outstanding reflex save to deny a volley by Charleston’s Kotaro Higashi to keep FCC ahead late in the first half of its season-opening victory. Trevor Spangenberg (RIC) - #LOUvRIC, 4/14/18: Spangenberg made three saves in the space of 15 seconds, including a point-blank rebound denial of Louisville’s Cameron Lancaster, for one of the most impressive short stretches of stops in the regular season.